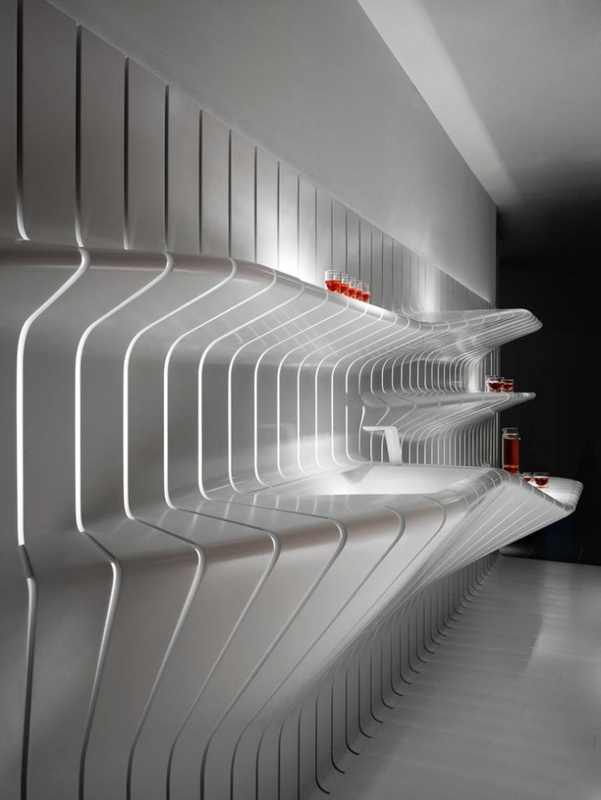 DuPont Corian and Amanda Levete_Architects (AL_A) surprised us in an astonishing manner in the 2009 edition of Milan Design Week. Sleek, transparent design with a single concept in mind _ a drop of water hitting the pond and creating ripples. 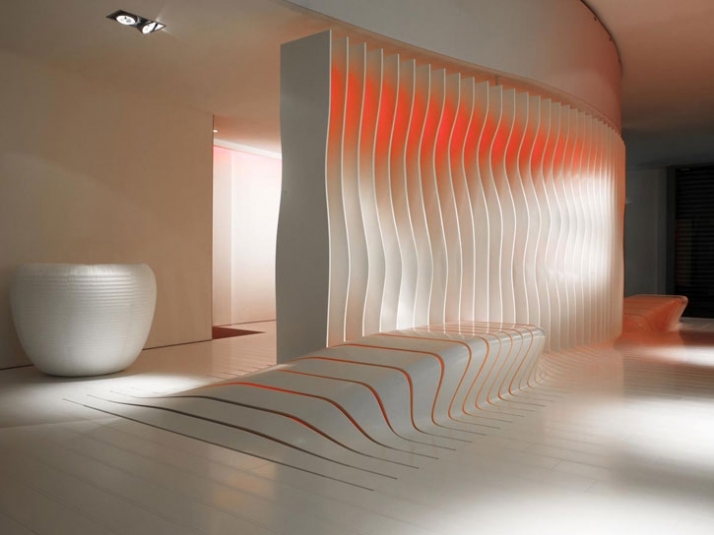 “Corian super-surfaces”, “super-succeeded” its capabilities in an astounding manner as we were offered the opportunity to see the material “push beyond the technical possibilities of DuPont Corian” with surface deformations. 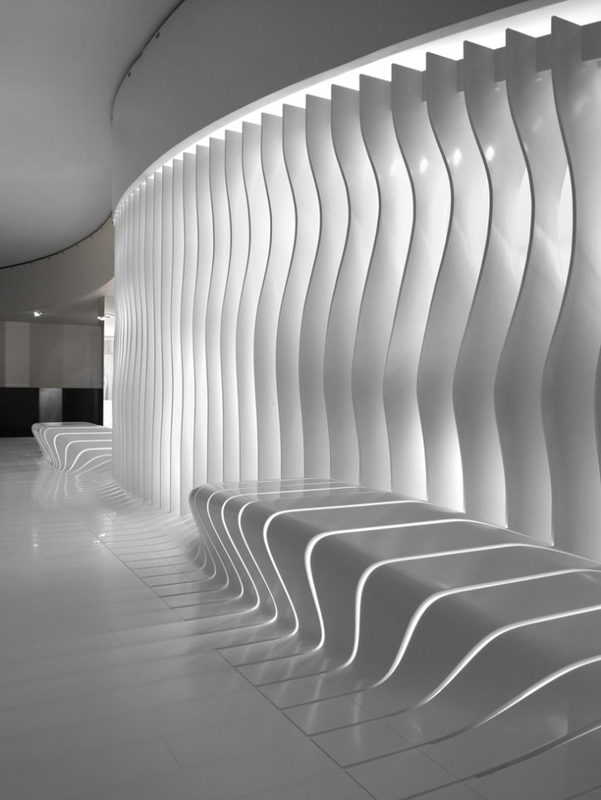 With the conceptual theme of a “lounge” environment a loosely defined area with people chilling, feeling relaxed and happy in an elegant environment and with the aid of advanced digital technologies, innovative fabrication techniques, and dynamic visual effects AL_A exposed the “super-surface” nature of DuPont Corian. The concept, a drop of water hitting the pond and creating ripples, was enough for AL_A to create an organic, ever-changing installation, the transit of people that create shadows which constantly transform according to the light, the animation, and the movement. 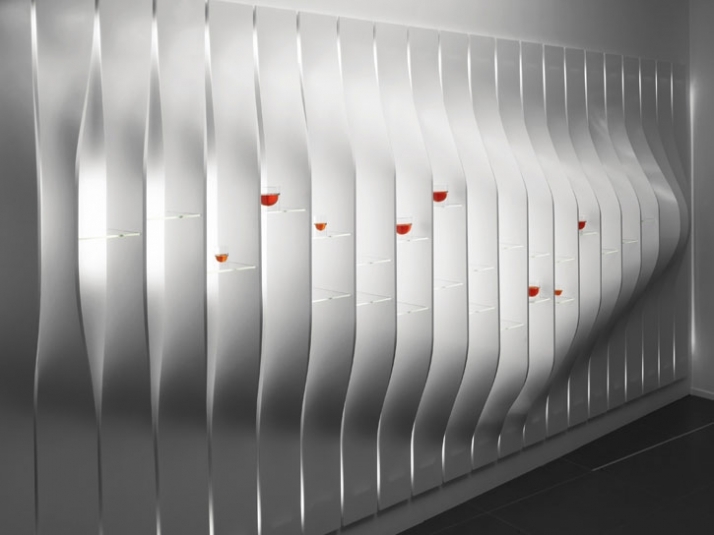 “The lounge is about revealing the moment of change through visual complexity.” Giving off a sense of mystery, as every shadow does, the sculpture-like installation that is simple yet very complex catches the eye with a wavelike motion. With a change of angle while strolling by the viewer sees something that is ever-changing with numerous possibilities, an installation that although still in one place constantly transforms, while the viewer is not able to catch the same moment again. 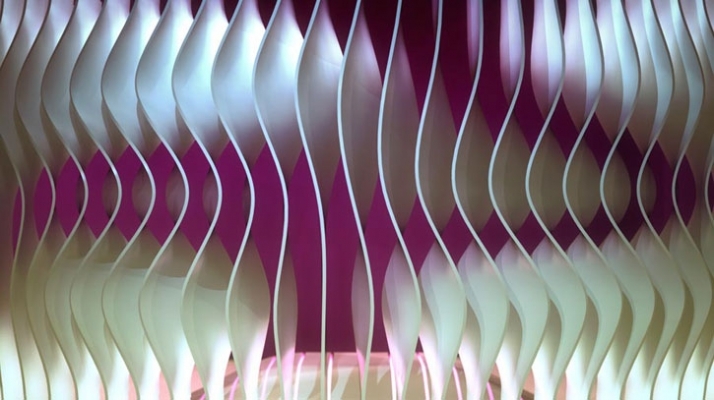 The material gives the person viewing the installation the need to touch it and feel it to see how this sleek material has been distorted and twisted in a marshmallow (confection) like appearance. 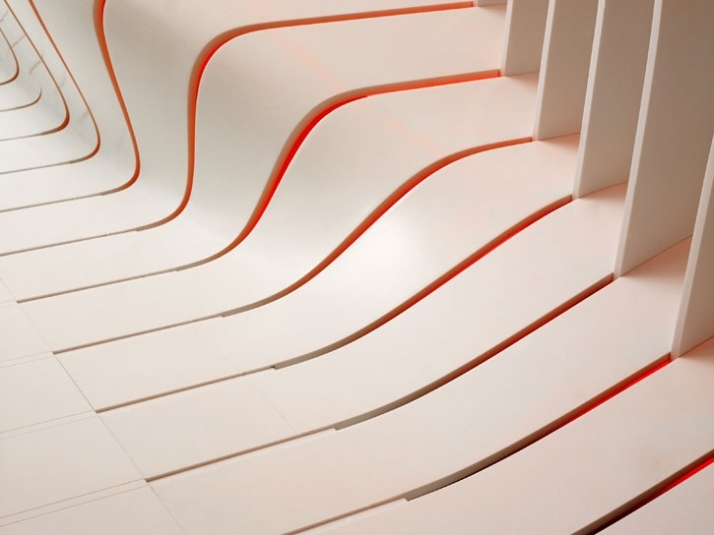 According to Alvin Huang of AL_A, “the key of the installation was to articulate corian as a key surface material.” Any other material used to present the installation would present it as a solid monolithic material. 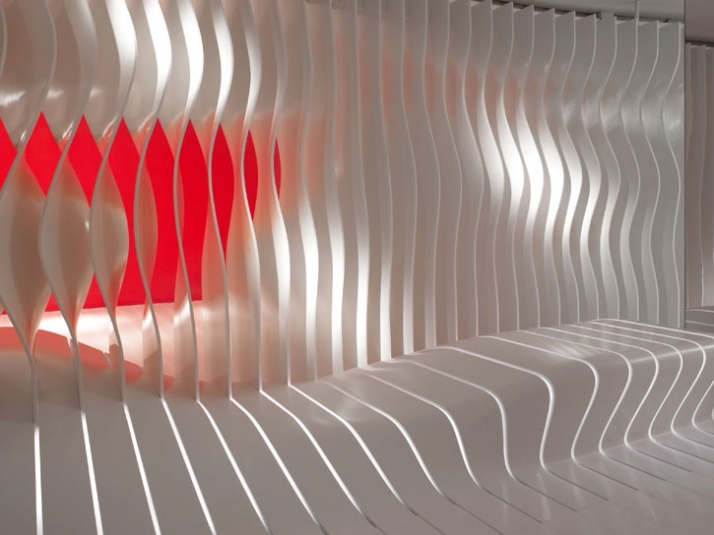 AL_A opt to exploit the pliability of DuPont Corian using twisted geometry of the sheets to bring structural integrity; a three dimensional surface; a “super-surface”. Advanced digital technology was used for the execution of the design and the fabrication, while emphasis was also given to the lighting. 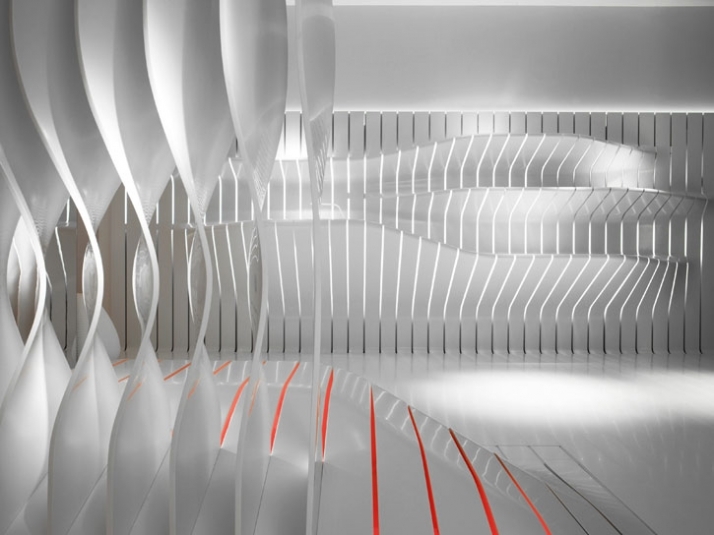 At street-level space of the Corian Design Milano Store showroom, the installation was unfolded to the viewers in a walk-through environment. With the key feature of a dividing curtain wall, articulated seating, indicative bathroom and kitchen environments, and display shelving carefully were revealing the moment “when a drop of water hits the pond, creating ripples”. Amanda Levete is an award-winning architect, together with directors Alvin Huang, Kwamina Monney and Ho-Yin Ng has formed Amanda Levete_Architects on a strong foundation of established and new projects with a reputation for work of originality and integrity. Amanda Levete Architects’ talented multi-national team of architects, designers, graphics specialists and engineers’ works at the intersection of design, technology and materiality. Their collaborative approach to the design process extends clients’ ambitions for their projects and produces groundbreaking work. Developments in digital fabrication have allowed the office to challenge conventional notions of form and space alongside the continued value placed on hand-drawings and hand-crafted models. 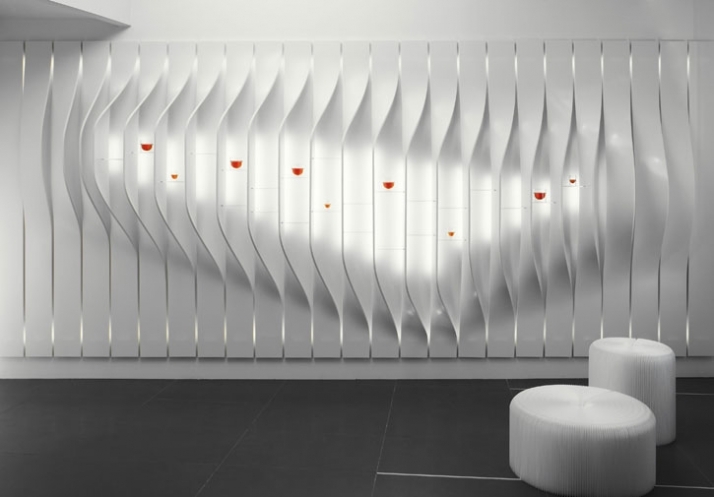 Amanda Levete and AL_A – a significant influence in the world of architecture and design, have spent their career exploring the transformative possibilities of space through a number of remarkable buildings and furniture pieces. AL_A is widely acclaimed for being able to bring visionary projects to realization, with success I could say! DuPont and AL_A designed and executed an installation for Milan 2009 Design Week that promoted harmony between the viewer and the natural world through design approaches so sympathetic and well integrated. The concept of a drop of water hitting the pond and creating ripples was clearly seen and defined throughout the installation and in all areas of the lounge. 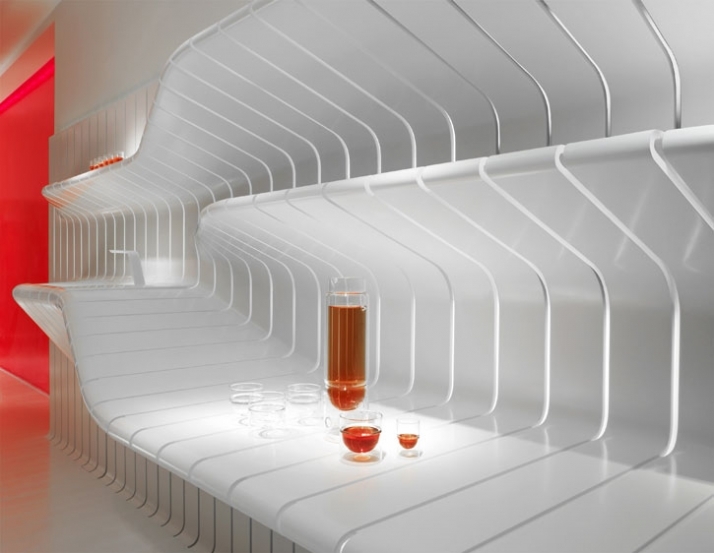 An organic design concept as it was clearly inspired by nature, a sustainable conserving and diverse design. It revealed to the viewer like an organism, from the seed within, while being flexible and adaptable to the environment.